Why is it important to exercise now? 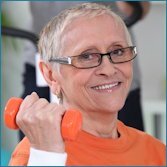 What can I do to get exercise? Where can I get more Information on exercising? Exercise is important for good health. Just a few minutes of activity a day can improve your overall well-being. It can give you more energy, reduce stress, and lift your mood. It can also decrease your risk of heart disease, colon cancer, diabetes, osteoporosis, and high blood pressure. Caregivers that exercise regularly are less likely to be depressed, anxious, angry, or stressed. Talk your doctor before starting an exercise program. If he or she gives you the go-ahead, make a list of some activities you enjoy or have always wanted to try. Then look into exercise programs at nearby fitness centers, community colleges, local senior or community centers, etc. You can probably find classes for your age group and fitness level. For a personal fitness program, consider a personal trainer. Your doctor or the local health club can recommend one. If exercise has not been part of your daily routine, start slowly. Begin at a comfortable level, and add a little more activity each time you work out. If you can, take a daily walk around your neighborhood or to a local park. When the hospital staff comes in to take the patient’s vitals, take a brisk walk up and down the hall. When you’re on the phone, walk rather than sit while you talk. When you’re not with the patient, take the stairs instead of the elevator, and park your car a bit farther away from your destination..
Get an exercise “buddy.” Ask a friend or family member to exercise with you, or to stay with the patient while you exercise. Bike to work, to run errands, visit friends or just for fun. If you have time, take a dance class, play a game of tennis, or play some volleyball. Go for a jog, swim or fast walk. Do some push-ups, or sit-ups. Do “chair” exercises like knee lifts, shoulder circles, and head/neck stretches. You can do these while sitting with your loved one at home or in the hospital. Many people find it helpful to keep track of their weekly exercise activities. Seeing your progress can motivate you. You can use this worksheet. Try to get 30-60 minutes of exercise 4 to 6 times a week. Include aerobic and strengthening activities. Aerobic exercise raises your heart rate and makes you breathe hard. Strength-training builds muscle in your arms, shoulders, chest, stomach, back, hips, and legs. Try to get at least 2 hours and 30 minutes of moderate aerobic exercise per week or 1 hour and 15 minutes of vigorous aerobic exercise per week. Try starting with 10 minutes. Do strength-training at least 2 days a week. Try exercising each muscle group 8-12 times a session. Don’t worry if you can’t do that much. Anything is better than nothing!